Practice your French in context with this easy French English bilingual story and discover a typical French library – une bibiliothèque + French vocabulary. 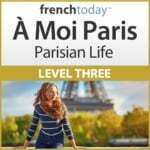 Let’s start by studying the French book vocabulary, then we’ll practice our French with an easy French English bilingual “learn French in context” story about going to the library in France. Je suis bénévole à la bibliothèque de Jugon les Lacs depuis plusieurs années. J’y travaille le mardi après-midi de 17 heures à 19 heures. Mes étudiants en immersion de français de French Today viennent souvent à la bibliothèque avec moi : c’est une bonne occasion pour eux de rencontrer des Français de tous les âges et de pratiquer leur français. I have been a volunteer at Jugon les Lacs Library for several years. I work there on Tuesday afternoons from 5 pm to 7 pm. My French immersion students from French Today soften come to the library with me: it’s a good opportunity for them to meet French people of all ages and practice their French. La bibliothèque est petite, mais très bien située sur la place centrale de Jugon, la place du Martray. Elle est ouverte une dizaine d’heures par semaine : le mardi soir, le mercredi matin et après-midi, le vendredi soir et le samedi matin. The library is small, but very well located in the central square of Jugon, the ‘place du Martray’. It is open about ten hours a week: Tuesday evening, Wednesday morning and afternoon, Friday evening and Saturday morning. Il y a une salariée, Marie-Emmanuelle qui y travaille, mais il y a aussi une quinzaine de bénévoles qui assurent les cinq permanences ou qui participent aux différentes animations proposées par la bibliothèque. There is an employee, Marie-Emmanuelle who works there, but there are also about fifteen volunteers who take care of the five opening sessions or participate in the various activities offered by the library. et des albums pour les enfants en bas âge, les tout-petits. and albums for young children, toddlers. Voilà pour la fiction. Il y a aussi une section de documentation pour adultes, et une autre pour jeunes. Ces deux sections utilisent toutes les deux le système Dewey pour la classification. Nous avons aussi une collection de CD de toutes sortes de musique, et de DVD de films pour adultes et enfants. That’s it for fiction. There is also a non-fiction section for adults, and another for youngsters. Both of these sections use the Dewey system for classification. We also have a collection of CDs of all kinds of music, and DVD movies for adults and children. Et il y a aussi beaucoup de livres en anglais : des livres pour aider la population locale à développer leur connaissances de ‘la langue de Shakespeare’. Ce sont, par exemple, des livres de lecture de différents niveaux de difficulté avec des CD pour aider la compréhension orale. Il y a aussi des livres bilingues : la page à gauche en anglais, et la page à droite en français. Nous avons des BD de Tintin et d’Astérix en anglais aussi… et bien sûr une collection d’albums pour les tout-petits. And there are also a lot of books in English: books to help the local population develop their knowledge of ‘the language of Shakespeare’ (as they often put it!). These are, for example, reading books of different difficulty levels with CDs to help with listening comprehension. There are also bilingual books: the page on the left in English, and the page on the right in French. We have Tintin and Asterix comic books in English too … and of course a collection of picture books for young children. L’équipe de bénévoles sous la direction de Marie-Emmanuelle est dynamique. Les uns visitent l’EHPAD local pour lire aux résidents. Les autres participent aux activités de TAPS avec des écoles primaires locales. Marie-Emmanuelle va aux crèches pour présenter les livres que nous avons. Les enfants des écoles primaires viennent en classe à la bibliothèque pour des séances de lecture et de prêt de livres. The team of volunteers under the direction of Marie-Emmanuelle is dynamic. Some visit the local old people’s home to read to residents. Others participate in extra-curricular activities with local elementary schools. Marie-Emmanuelle goes to nurseries to present the books we have. Primary school children come to the library in school time for storytelling sessions and to borrow books. La bibliothèque organise de temps en temps des réunions du club de lecture pour adultes, ou des rencontres avec des écrivains locaux. Une fois par an il y a un grand spectacle pour les enfants, et c’est toujours très populaire. The library occasionally organizes adult reading club meetings, or meetings with local writers. Once a year there is a big show for children, and it is always very popular. Une membre de l’équipe de bénévoles, Christine, fait un atelier de scrapbooking le premier samedi du mois. Le travail de Christine est très minutieux, elle donne beaucoup de conseils aux participants, et les articles finis sont très attrayants. One member of the team, Christine, does a scrapbooking workshop on the first Saturday of the month. Christine’s work is very careful, she gives a lot of advice to the participants, and the finished articles are very attractive. Puis le dernier samedi du mois, c’est mon tour ! Un mois sur deux, je fais une animation pour enfants de 6 à 11 ans, avec des activités ou des jeux basés sur les livres anglais de la bibliothèque. L’autre mois, je fais une animation pour ados et adultes, toujours pour mettre en valeur les livres anglais de la collection. Then on the last Saturday of the month, it’s my turn! Every other month, I do a session for children from 6 to 11 years old, with activities or games based on the English books in the library. The other month, I do a session for teens and adults, again, to promote the English books in the collection. La bibliothèque est un lieu de rencontre et d’échange, et j’aime bien y travailler. Ça fait du bien de faire partie d’une équipe bien soudée ! The library is a place for meetings and exchanges, and I like to work there. It feels good to be part of a solid team! Est-ce que vous êtes abonné(e) à la bibliothèque ?- Are you a member of the library ?